Earlier this year Monolith Soft, the creators of the action-role playing game Xenoblade Chronicles for the Wii, released a handheld exclusive port titled Xenoblade Chronicles 3D for the New Nintendo 3DS. With an average metascore rating of 86, many gamers fell in love with Shulk and his band of friends all over again. It was no surprise that when Xenoblade Chronicles X was first revealed in January 2013, that gamers have been clamouring to get their hands on the game. To many of gamers delight, Nintendo have announced a special edition just for North America that is perfect for Xendoblade Chronicles fans. In this new game, Earth is destroyed and humanity faces annihilation from an intergalactic war between two alien races. Players must fight for their survival and explore a new planet full of exotic and hostile life-forms.Traveling around this new planet is done by piloting customizable mechs called “Skells,” that are equipped with powerful weapons. You can even customize combat and defensive skills called Arts to strengthen your strategies and defeat enemies with ease. Xenoblade Chronicles X launches December 4th for Wii U. I for one can't wait to explore the new alien planet and discover new life forms all in grandiose fashion. 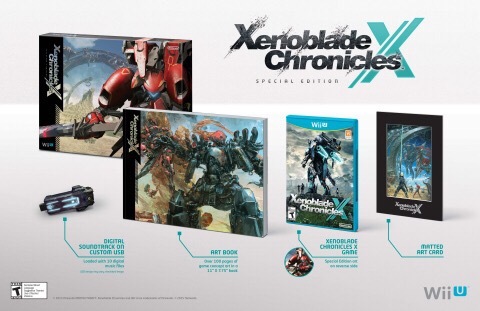 For more information visit the official Xenoblade Chronicles X website.